Black History Month: John H. Ruffin, Jr. 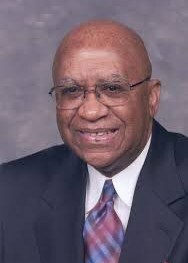 In honor of Black History Month, today I’m highlighting The Honorable John H. Ruffin, Jr.
Affectionately known to my children as Pop-Pop, John H. Ruffin, Jr. practiced law for 33 years before becoming the 62nd judge of the Court of Appeals of Georgia. He was a self-made man of many firsts on the judicial circuit, and a proud father and grandfather. I chose to highlight Judge Ruffin, not only because of his life’s achievements, but because he was a lover of the written word. Like me, Judge Ruffin kept a notebook of ideas for his writing. After reading from one of many books in his vast collection, he often took to the pen to write down a quote here, or a funny anecdote there, that he would later use in one of his many speeches to either inspire his audience or evoke laughter, for he loved to make others laugh. Through his life and death, he has given his grandsons the gift of perseverance. As my boys age, they learn something new about Pop-Pop’s life that continues to make them proud. He has paved the way for them to take the initiative and not fear pursuing their dreams. From his career of practicing law – to becoming the first African-American Superior Court Judge for the Augusta Judicial Circuit – to having a courthouse named in his honor, Judge Ruffin leaves a proud legacy. Click the links above to learn more about The Hon. 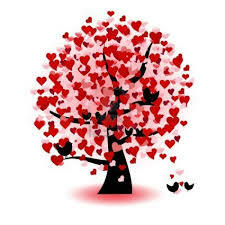 John H. Ruffin, Jr.
It’s Valentine’s Day! The day that many couples fuss over, puppy lovers drool over, and singles dread if no one significant is in their life, has finally come. 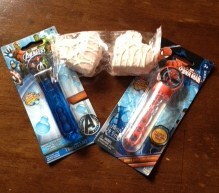 And while this day can be highly stressful for many, it’s still a fun day for kids. Now, I’m not much of a fan so I don’t typically do much for Valentine’s Day. It’s too commercial for me. Besides that, it falls right between three birthdays in our household which can become pretty draining financially. But despite all that I am a mother and a wife first and since my Dad always made Valentine’s Day special for my sisters and me, then so it shall be for my boys. Therefore, I make it a point to make this day mean something to them each year. This year, since this special day fell on a Friday. 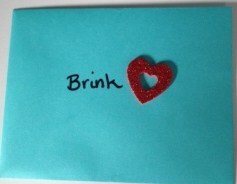 I thought it would be fun to give a small token of love on each day of the week leading up to today. Nothing extravagant. Just simple little tokens with a handwritten note to show them I love them. (Of course I did simple tokens for my hubby too, but that’s another post). Valentine’s Day can still be special in spite of how commercial it’s become. So, here’s a walk through our week of Love . 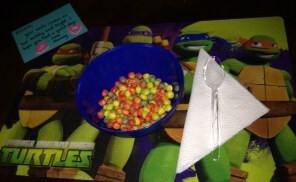 . .
Monday – Just a simple love note tucked in an everyday spot for each of my fellas, big and small, to show I care. 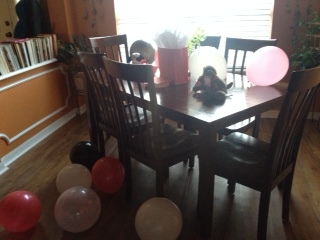 Wednesday – The boys came home to a bubbly surprise with a Valentine’s snack and another love note from yours truly. 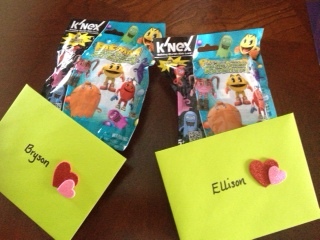 Thursday – A small greeting from Pac Man and a love note awaited their arrival from school on this day. 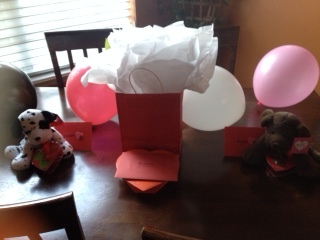 Valentine’s Day – And finally, a new cuddly friend (stuffed), the last love note, sweets & treats, and balloons awaited them to cap off the festivities. Show a little love to those nearest and dearest to your heart. It’s Black History Month! This is a special time of year for African American families. This is our time to reiterate with our children the importance of our rich history and many contributions to our country. As each year passes, I can’t help but feel as though Black History Month is becoming a dying tradition. But for many of us, it lives on and we aim to make it thrive and keep the celebration alive. We live in changing times. It is truly remarkable how far we have come as a race of people in our country, but there is still much to be accomplished and desired. So many African American youth are growing up lacking knowledge of their history – our fight to become recognized citizens or to be recognized as humans for that matter. This is not to dwell on the past or prove that as a people we can’t move on and just be happy with what we have. Instead, it is about understanding our roots in order to understand our path in life. Children (all children) must understand the history and origin of their family. I believe that when you have a full understanding of how you began, it helps to clear the way for a more successful life in the future. This is what Black History Month does for our culture. Don’t assume that this means we only acknowledge our culture once a year. My skin is brown 365 days a year (366 in a leap year) therefore, Black history is every day for me! Ask most African Americans and they’ll tell you the same. My husband and I do our best to teach our children about renowned African American figures as well as those not so well known. Black History Month is the opportunity to celebrate African American culture – who we are, what we are, and what we strive to become. There’s no hatred in that, just good old fashioned pride. Challenge yourself to learn something new each week about an African American contributor, activist, artist, musician, entertainer, inventor, writer, author, orator, or entrepreneur. And I do mean challenge yourselves people. No Dr. King, Rosa Parks, or Ruby Bridges. You already know them. But really try to learn about someone you’re not familiar with. I follow two blogs that feature information on African American Achievement daily. I’ll post them below. These blogs will be a great start to educating yourself on our rich history. Black America Web features a segment daily known as Little Known Black History Fact. Each day this segment provides a tidbit about an African American figure, their life, and their contributions. Black America Web is sponsored by The Tom Joyner Morning Show, a nationally syndicated radio talk show that airs daily. You can check your local listings for stations and times to hear the Little Known Black History Fact each day. The Brown Book Shelf will feature an African American writer or illustrator for each day throughout the month of February. This is day 5. Click the link to find out the featured author/illustrator of the day. Explore to read about others who have been featured since February 1st.